Oh, how I wish we could say Fall was “in the air” – but here in sunny Florida - #notsomuch. But, I CAN say Fall is “on the way” – and that’s good enough! The temps are dipping ever so slightly and the last quarter of the year, with all of its festive glory is upon us for sure! Despite the still warm temps – September definitely had some bright spots! Reading! I managed to get back in the groove a bit. My fav from the past 30 days was “Eleanor Oliphant is Completely Fine”. This fiction novel, written by Gail Honeyman has been on the New York Times Best Sellers list as well as a Reese Witherspoon Book Club Pick. The main character is a quirky loaner with seriously “off” social skills and a dark past. The novel takes us on Eleanor’s journey as she learns to emerge from her shell, finally address her stormy upbringing and learn what love and friendship are like. I thoroughly enjoyed it and found Eleanor to be funny, honest, interesting, smart and totally worth rooting for! Here are some other reviews from Amazon.com where I made my purchase. This little beauty I got for the house and I LOVE it! I especially love supporting Etsy Makers and am often delighted with the quality and care I can find amongst all the creative who sell on this platform. 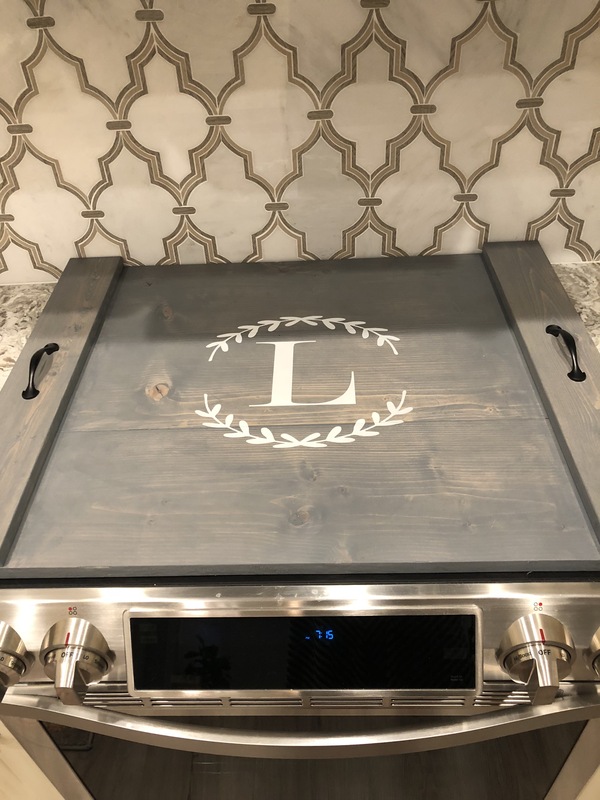 This is a Stove Cover or Range Cover that I didn’t know I needed – I was shopping for another hand made wood item when I saw this unique and decorative treasure in this amazing Etsy Shop. It was $81.00 and totally worth it. The quality is great, the color is perfect and I love the design element it adds to my kitchen. Happy Dance! Speaking of my kitchen lets turn to something that made my tummy smile! Pickle Chips! Not actually potato chips – but Crunchy Fried Pickle Toppers from French’s. You know those fried onion rings you put on top of casseroles? These are them – just in pickle variety. Sounds weird I know – but they are so tasty! I put them on top of salads, sandwiches and even hummus. There was also a jalapeño variety I saw on the shelves of my Publix but I haven’t tried those babies yet. I also picked up this cool little closet storage gadget – the Dazz – 6-tier smart carousel organizer. I got mine at a new-ish store called At Home. It’s like a giant Home Goods! And I mean giant – like a Costco. Basically – heaven! This thing swivels 360 degrees and has pockets and cubbies everywhere. I put mine in my spare bedroom closet and used it for overflow clothing – folded sweaters, scarves, mittens, belts and hats. It was only $19.99 and I can see it also working well for craft storage, pantry storage and even corralling gift-wrap supplies. For me September always takes me back to Tallahassee… literally! The start of College Football Season is a big deal in my house and we truly look forward to our weekend treks to Tally. The hubs and I LOVE our Seminoles and the vibrant atmosphere that GameDay brings. And while our team is having a dismal year (we call this rebuilding when we’re being nice) we still enjoy the lifelong friends, traditions and fun times these weekends offer.